Jinshanling Great Wall is located at Bakeshiying town, Luanping County, Chengde city, Hebei Province. Amazing Jinshanling distance from Beijing is around 130km, northeast of the city. With only a 2 hour drive from Beijing, amazing Jinshanling is a relatively undiscovered tourism destination far off the beaten track. In the map below: (A) = Tian’anmen, Beijing. (B) = Jinshanling entrance. One of Beijing’s great walks, Jinshanling offers what we think is the best one day walk from Beijing. If you are looking for real travel experiences, not just a whistle stop tour of famous landmarks, then you’ll love the walk from Jinshanling to Simatai. Jinshanling remains wild, ruined, preserved, original and is a bit more inaccessible and definitely less touristy than Badaling and other restored sections. With the freeway just two hour drive from Beijing, Jinshanling Great Wall is in fact highly accessible despite seeming remote. Great Wall one day tour from Jinshanling to Simatai is easily a day trip that you’ll remember for a long time. 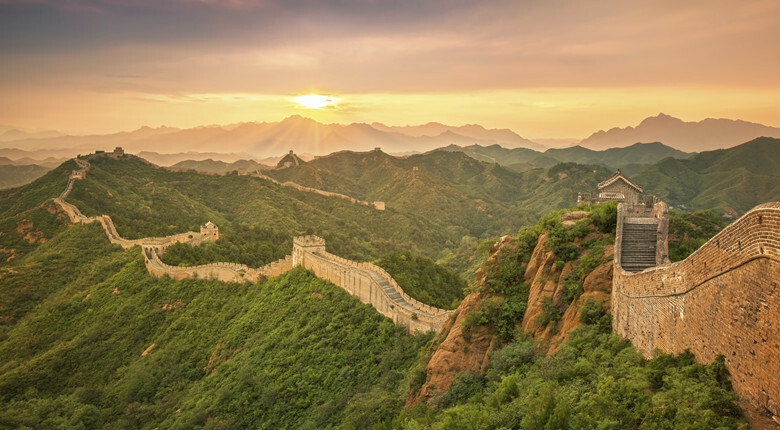 First constructed by General Xuda in 1368, then largely repaired, renovated and expanded by the legendary General Qi Jiguang in the 1570s, the high-quality Jinshanling Great Wall is named after the beautiful bigger and lesser Jinshan Mountains where the Wall is located at. The 11 km long wall offers enough space as soldiers shelter, warehouse and arsenal of weapons along with 5 passes, 67 towers and 2 beacon towers. General Qi gained the trust and respect from the Emperor Muzong after successfully defeated hordes of Japanese pirates, and masterminded the construction of more than 1,000 watch towers on the wall. The statue of General Qi jiguang is just in front of the entrance to Jinshanling. He also wrote a famous combat manual explaining swordsmanship techniques. You will see Beijing from the highest place on Jinshanling Great Wall on a clear day. There are lots of maple tree and apricot tree on the mountain. In summer, with its grant trees and grass, people would feel much cool than other ones. Green vegetation and colored flowers cover the mountains in Spring. While in winter the mountains is covered by white snow. This area is famous for its chestnuts and persimmons. In June, 2012 Jinshanling cable car celebrated 10 years of service to Great Wall Jinshanling. A favourite of visitors and locals alike, Jinshanling cable car allows easy access from the foot of Jinshanling hill to the top entrance of Lesser Jinshanling Tower. 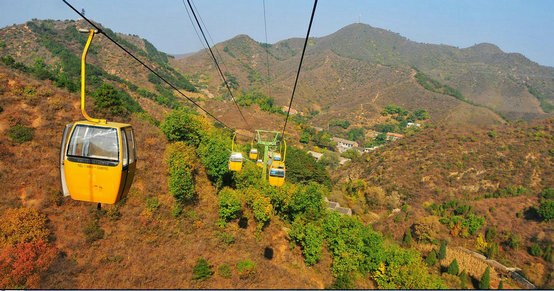 By riding cable car up, Jinshanling is only five minutes walk away from the cable car station. Jinshanling cable car will let you avoid the initial climb up and drop you off at Lesser Jinshanling Tower in 17 minutes. Open hour: 8am-5pm in summer. 8:30am – 4:30pm in winter. Seating capacity: 2 passengers. The total length of cable car runs 1000 m with an altitude difference of 150 m. Cable car operates all year around and it only closes when it’s raining / snowing or other severe weather conditions. You have to move a little bit fast when riding up. Simatai Great Wallin the East and Gubeikou Great Wall in the west. As Simatai East is currently closed from June, 2010 as the result of redeveloping Simatai area for a hot springs resort by Miyun local district government. Re-opening date is unclear. Still, walking from Jinshanling to Simatai West is rated highly for some great walking with picture postcard photo opportunities around every corner. The distance between Jinshanling and Mutianyu is around 125km, only a 2 hour drive from each end by road. As public transport is not available to both ends, one-way car hire with local driver from Jinshanling is a really good value for your money if you’re planning a trip to Mutianyu / Jiankou from Jinshanling. This way is much more cost-efficient if you are travelling with 3 or 4 friends. In the map below: (A) = Mutianyu, Beijing. (B) = Jinshanling entrance. Mountain weather can change rapidly and unexpectedly. Weather at Jinshanling is usually like Beijing. Spring (March to May) has much wind sometimes sandstorms. Summers (June to August) are hot, humid, and sometimes rainy. Autumn is generally comfortable. January is the coldest month while July is the warmest. If high winds, heavy rain/snow or low cloud is predicted then postpone your walk for another day. Before you start your walk check the Jinshanling Weather Forecast. Jinshanling Great Wall in winter is generally dry and sunny. When winter arrives, Jinshanling usually snows on late December or sometimes on early January. The mountains and the wall itself are often covered with frozen ice and snow. You would enjoy breathtaking scenery and a mountain of fresh virgin snow at Jinshanling. Walk from inshanling to Simatai West, a journey you won’t forget in a hurry – for all the right reasons. 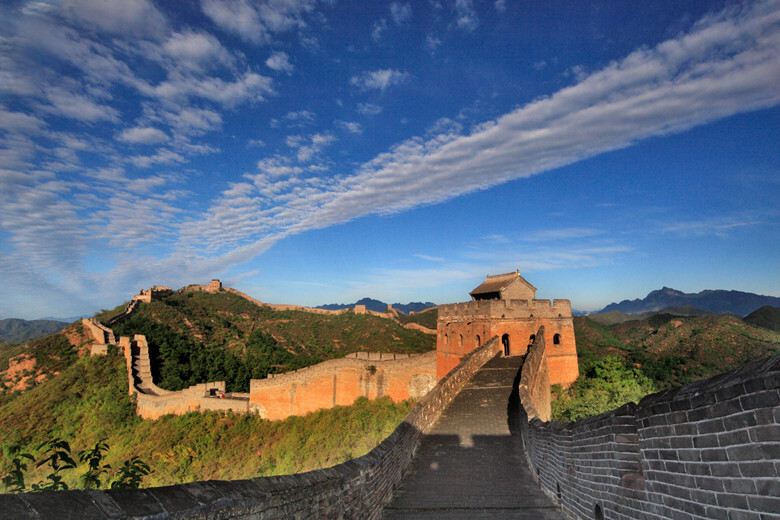 Jinshanling Great Wall day tour will bring you the classic Great Wall experience with great hiking trail. You will enjoy your entire walk from Jinshanling to Simatai without crowds. 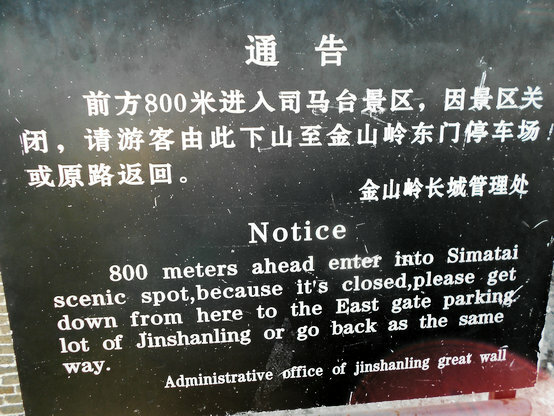 Start / Finish: Jinshanling – Simatai West. Public transport is NOT available to both ends from Beijing. A quicker, easier option is to hire a taxi or arrange private vehicle transport from Beijing. Generally takes about 2.5 hours to get there. This hike can be done in either direction. As Simatai East is currently closed, you need to backtrack a short distance and then descend via a newly constructed trail toward a new parking area once getting off the Wall. Season: All year. Spring and fall offer fine weather. Winter can also bring clear skies, however, snow and ice can make conditions a bit on the slippery side. Summer can be hot and hazy. Maps / Info: No map necessary. Simply follow the wall. Walking tips: Take comfortable walking shoes. Jogging shoes will do. A solid pair of hiking gloves and wear comfortable clothes. Trek light. Don’t carry too many heavy things. The more further and higher you walk the more beautiful the experience. Practice going up and down some hills at home so your knees are ready before your departure! Most people do this walk as a day hike out of Beijing. If you decide to stay overnight in either Gubeikou, Simatai or Jinshanling, local farmer’s guesthouses are available or camp overnight on the Wall. You’ll find quality hotel, guesthouses and back-to-nature camping at Jinshanling. 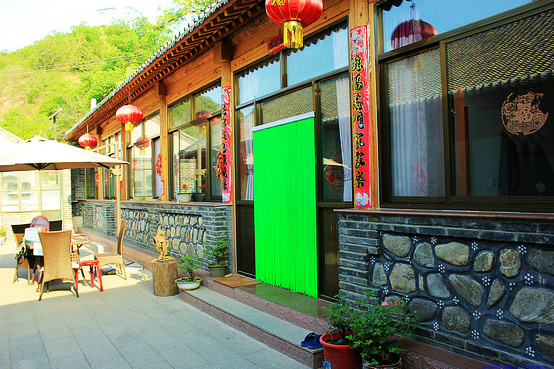 Villagers’ guesthouses are a unique accommodation option if you want a real taste of rustic, authentic Jinshanling country life. Villager’s guesthouses at Jinshanling like a hotel, but a bit more basic. The rooms have air-conditioning, hot water and TV (Some don’t have TV) and are generally equipped with 2 single beds. Guesthouses lets you feel like part of the farming family and is great if you’re travelling with a couple of friends or children.